You’d have seen many rock formations on internet. The Al Naslaa Rock formation may puzzle you to see two standing stones and flat faces are completely in natural shape. 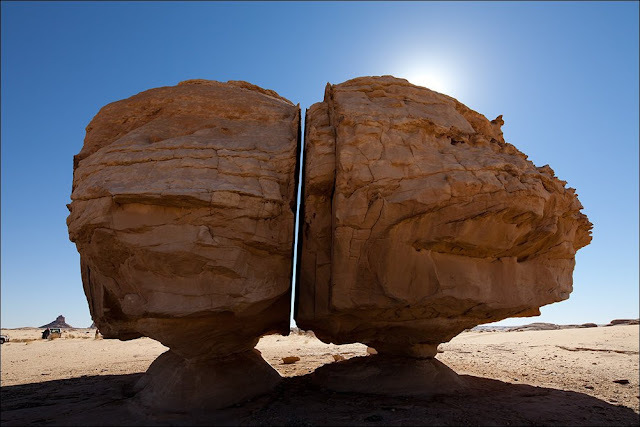 A perfect slit between rocks seems a machine work, but it is amazing natural. 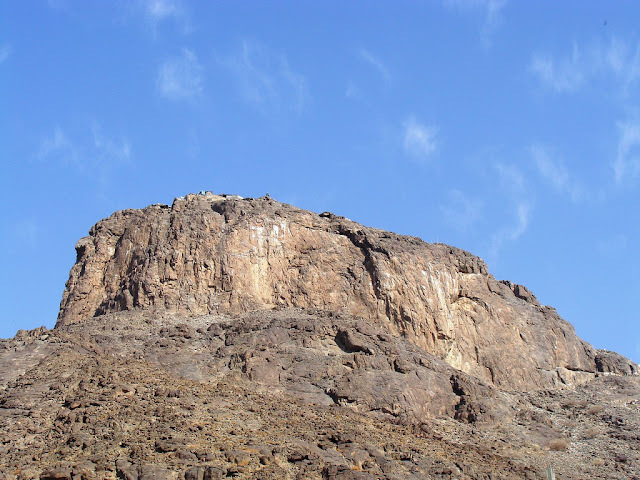 Al Naslaa Rock is located in Tayma oasis, Saudi Arabia. The archaeologist believes Tayma has been inhabited from ancient times. 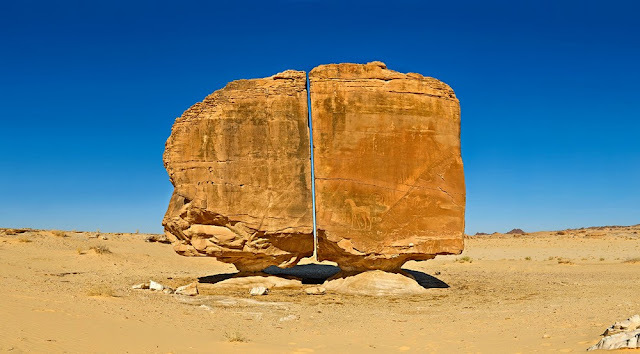 The standing stone of Al-Naslaa truly are a big mystery. Two stones split in half have created confusion among experts ever since their discovery. 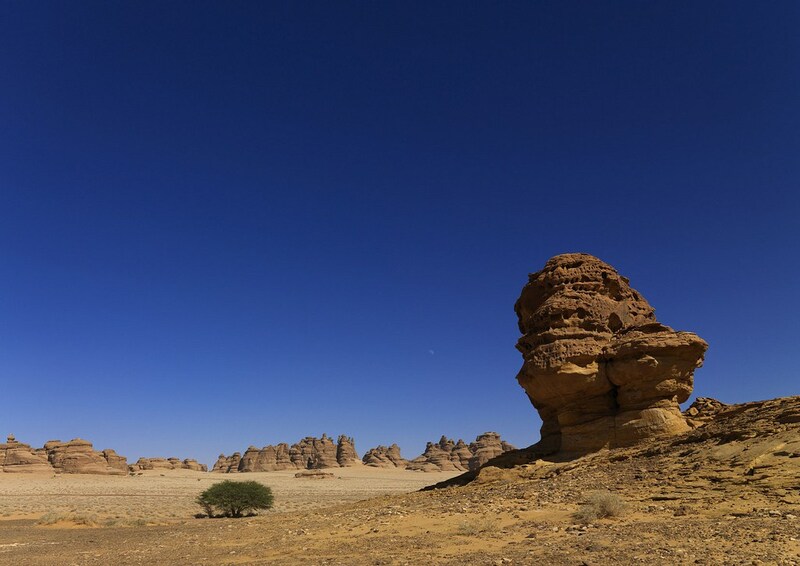 Al Naslaa Rock is most photogenic petroglyphs in Tayma about an eight-hour drive out of Riyadh. The small pedestals have given added support to boulders. So, archaeologist not sure how rock formation remains balanced here? How did the rock cut in the middle? 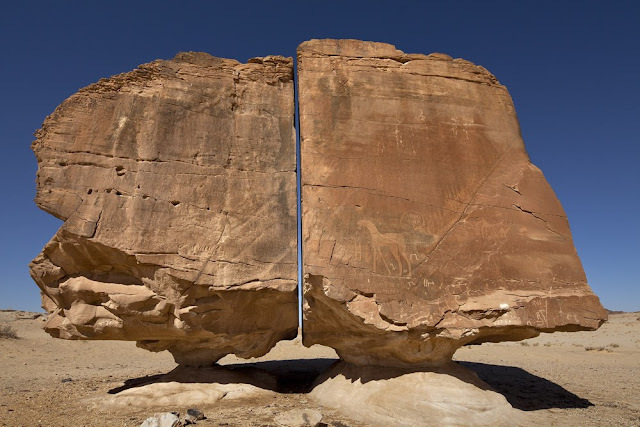 The fascinating megalith stones were split in half with look like a LASER precision. Take a deep breath and believe the locals of Arabian Rock Art Heritage site when they tell you it’s a naturally occurring phenomenon, though we have no idea how it came to be. Perhaps the ground shifted somewhat underneath one of the two supports and the rock split. It could also be from of volcanic dike of some weaker mineral that solidified there before everything was exhumed. Or, it could be an old pressure crack you see a parallel crack just to the right of it that has been pushed/pulled apart some. Also it could be an old minor fault line, since fault motion often creates a zone of weakened rock that erodes relatively easier than the surrounding rock. It all recommends that at some point it must have been worked on by very precise tools, some have even ventured out and said laser-like tools. Many legends said, it is one of the greatest mysteries found by man. The incredible ancient stone structure entices thousands of tourists each year who come to Al-Naslaa. And observe its perfection and balance, which has given rise to myriad theories that try to explain its origin. Squinting in the Saudi desert, unprecedented archaeological discovery of camels carved on russet-hued rocky spurs that could shed new light on the evolution of rock art. Almost a dozen humped sculptures, some of them damaged from erosion and vandalism, are probably around 2,000 years old and were recently discovered in a private property along a desert crossing in the northern province of Al-Jouf. The sculptures, which also depict equids, or hoofed mammals, show a level of artistic skill unseen in other rock art forms in the Saudi desert. This is great work of artistry and creativity, now well known in archeological circles as “the camel site”. 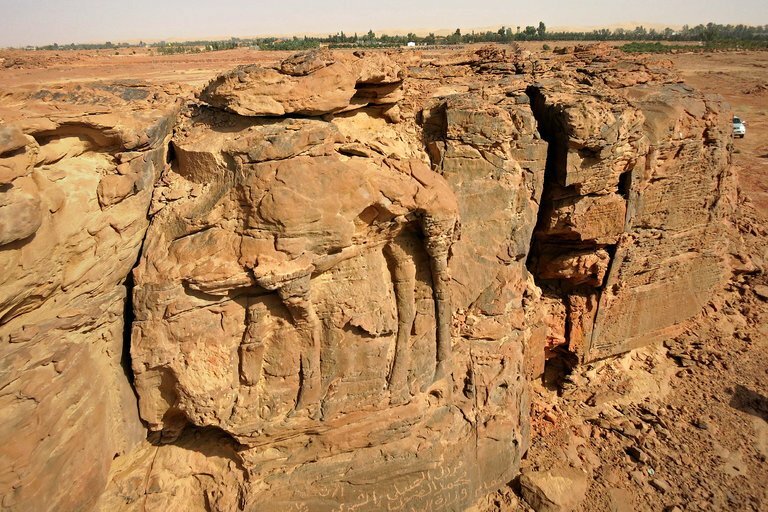 Khalifah a researcher explored the site in 2016 and 2017, accidentally found the carvings, when a local friend told him about camel shaped mountain. Despite detailed artwork, the ancient artists left very few inscriptions or pieces of writing behind unlike at many other rock art locations. 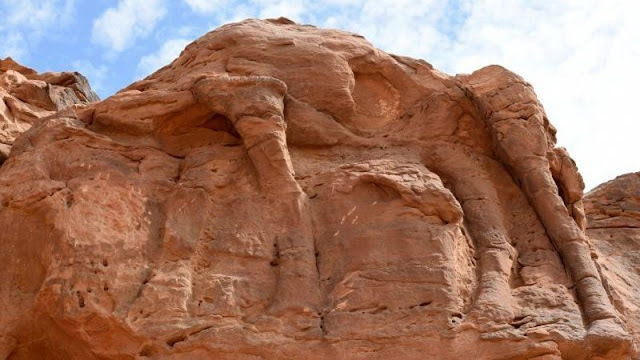 Indeed truly unique and rare camels were carved in the mountain outcrops for centuries venerated as the “ship of the desert “are a familiar motif in artworks from the kingdom. The three dimensional engravings featuring only part of a camel’s body such as the hooves, differ from those discovered at other Saudi sites. Many are perched high on the outcrops and would have required ropes or scaffolding. Moreover, one engraving in specific stands out a camel facing what appears to be a donkey, mule or horse, animals that have rarely been represented in the region’s rock art. The incredible carvings show great skill in their level of naturalism and their sheer size. This discovery may potentially change the understanding of prehistoric population dynamics and cultural traits. However, the site is shrouded in mystery, with little information on who created the carvings or the tools they used. The closest Nabateans tribe known for founding the city of Petra in modern-day Jordan that was carved out of sandstone desert cliffs. In one rock panel there is a camel lying on the ground with its head tilted toward a donkey that is on its feet. The two are nearly touching. The discovery has shone a spotlight on Saudi Arabia’s rich bedouin heritage. The kingdom is endowed with thousands of examples of painted rock art and ancient inscriptions. 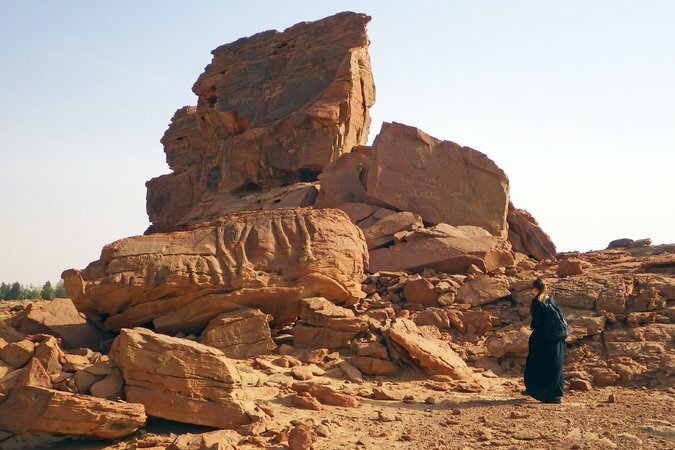 This discovery will show variety and richness of the Saudi Arabian past have different styles, which suggests there was more than one artist behind them. Archaeologists say, it is possible, that the Al-Jouf site was one of veneration or on a caravan route used as a resting place or boundary marker. The site is an emblematic place on the regional and caravan routes towards Mesopotamia. Thus, further fieldwork is now required to find the answers. Many of the eroded sculptures are hard to date, but archaeologists estimate they were possibly completed in the first centuries BC or AD. If they pre-date the domestication of the camel, then they represent wild specimens who may have been hunted, and a successful hunt may have been vital for the survival of the local human populations. Also visible alongside the engravings were painted art forms, which showed human and mythological beings and an object that appeared to look like a chariot. Mada’in Saleh is one of the most remarkable and exciting archeological sites in the world. 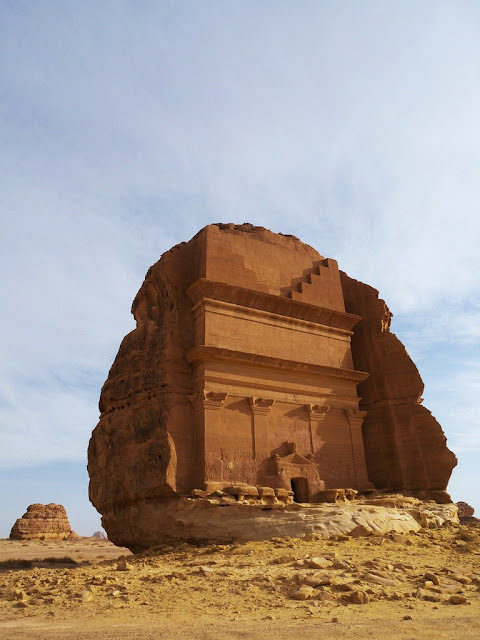 Most of us know about Petra in Jordan but very few peoples have even heard of Mada’in Saleh, the second largest settlement of Nabataean people after Petra. 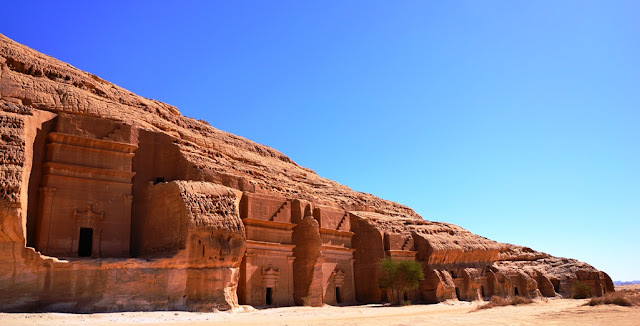 Mada’in Saleh (cities of Saleh) is a pre-Islamic archaeological site located in the Al-Ula Region of Saudi Arabia sector about 400km north-west of Madinah and 500 km south-east of Petra, Jordan. 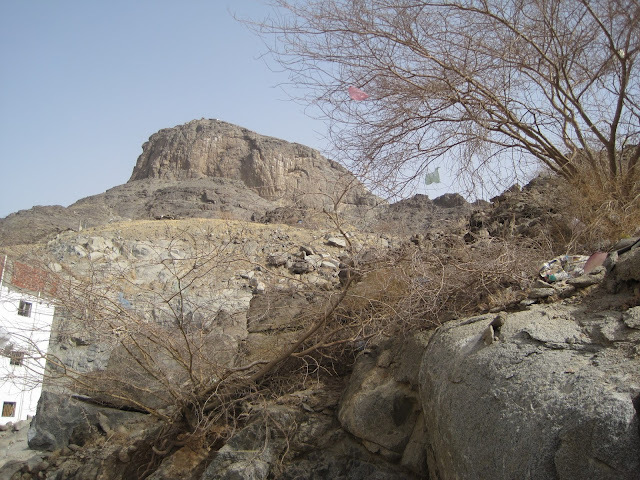 This is the place, where nomadic tribe of Thamud lived, which were famous for its idol worshipping, oppression and tyranny became prevalent. Mada’in Saleh is also called “Al-Hijr” or “Hegra”, this was the area, where Prophet Hazrat Saleh A.S. was being sent by Allah (Glorified and Exalted is He) to guide them but they didn’t accepted his teachings and were destroyed by an earthquake. Well, the Prophet Hazrat Saleh A.S, to whom the site's name of Mada'in Saleh is attributed, called the Thamudis to repent. 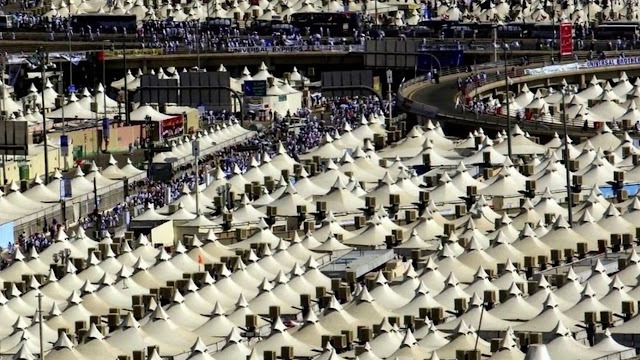 But the Thamudis disregarded the warning and instead commanded Prophet Hazrat Saleh A.S to summon a pregnant she-camel from the back of a mountain. And so, a pregnant she-camel was sent to the people from the back of the mountain by Allah Talah, as proof of Saleh's divine mission. Though, only a minority of peoples heeded his words. While the others non-believers killed the sacred camel instead of caring for it as they were told, and its calf ran back to the mountain where it had come from, screaming. 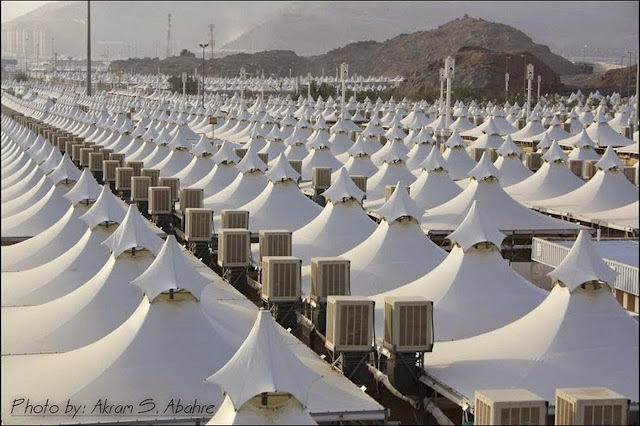 The Thamudis were given three days before their punishment was to take place, since they disbelieved and did not heed the warning. The Prophet Hazrat Saleh A.S. and the believers left the city, but the Thamudis were punished by Allah Talah when their souls leaving their lifeless bodies in the midst of an earthquake and lightning blasts. 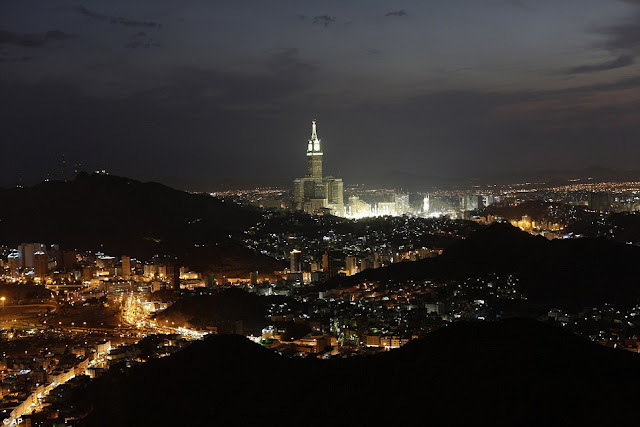 The Muslims Holy Book Qur’an says; Thamud carved out homes in the mountains were punished by Allah Talah for their practice of idol worship, being struck by massive earthquake and lightning blasts. 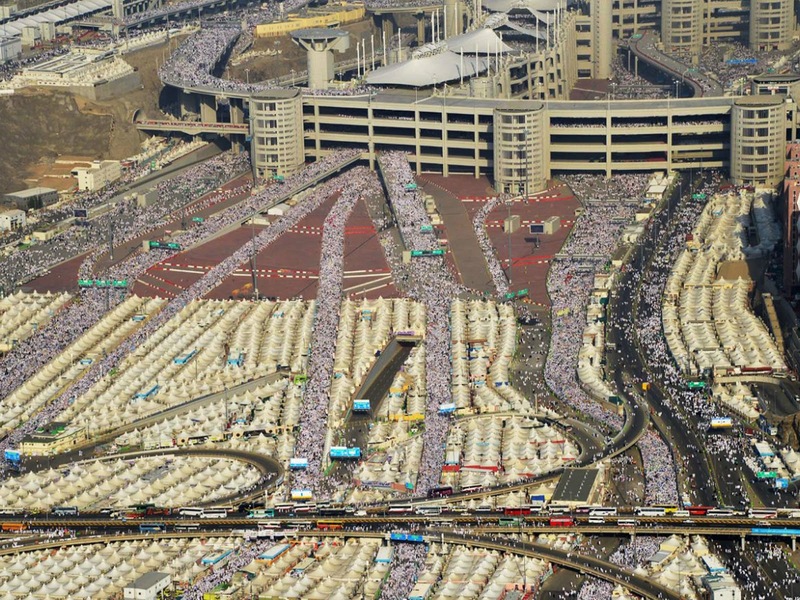 So the earthquakes seized them and they lay dead, prostrate in their homes. Then Hazrat Saleh A.S turned from them, and said: "O my people! I have indeed conveyed to you the Message of my God, and have given you correct guidance & path but you like not good advisers. 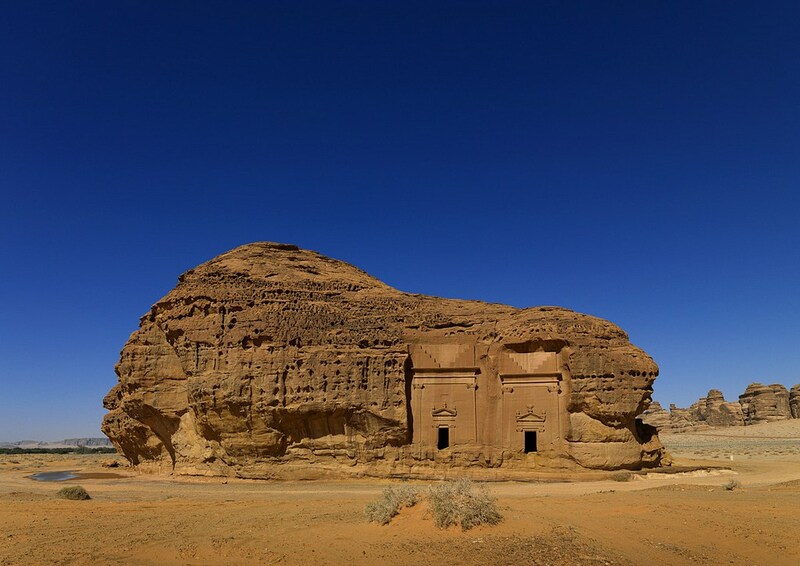 In 2008, Mada’in Saleh has become Saudi Arabia First UNESCO World Heritage site, selected for its well-preserved remains from late antiquity, particularly the 131 rock-cut monumental tombs, with their elaborately ornamented façades, of the Nabatean kingdom. The site setting on the plain foot of a basalt plateau, notable for its desert landscape, marked by sandstone outcrops of various sizes and heights. The ruins of the town of Hegra are, still for the most part unexcavated, were made of unimpressive sun-dried mudbrick. The Qasr al Bint, “Palace of the Daughter or Maiden,” is the largest tomb façade at Hegra, with a height of 16 m. It lends its name to a group of adjacent tombs. The most photogenic and most iconic symbol of Mada’in Saleh is Qasr al-Farid, a single tomb carved into a small dome that stands alone in the open. Moreover The Jebel Ithlib is a monumental outcrop topped with a complex of spires in the northeastern part of the site. The Jebel Ithlib sanctuary a canal channeled water into a cistern. Its enormous cliff faces have small sacred niches and altars carved into their otherwise unhewn surfaces. Mada’in Saleh is gleaned from the inscriptions displayed on the site, which comprises of more than 100 decorated tombs and 1000 non-monumental graves, bearing both inscriptions and cave drawings. 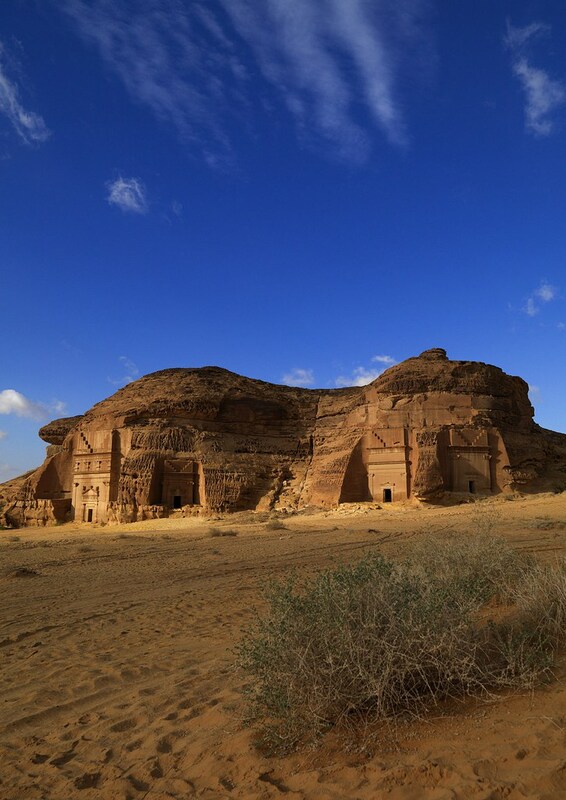 Though the site is alike to Jordan’s Petra, the Nabataean city of Mada’in Saleh surpasses its better known neighbor. The multi-ethnic symbols and datable graves of the site, as well the exclusive sandstone cave structures, facilitate a better understanding of the Nabataean tribe and Mada’in Saleh, an ancient city that once served as the most vital stop on the caravan route between Southern Arabia and the Jordan Valley. The recent archaeological investigation is slowly disclosing the hidden treasures, and the most acclaimed and iconic parts of the site today are “Qasr al Bint” and “Qasr Al-Fareed”. 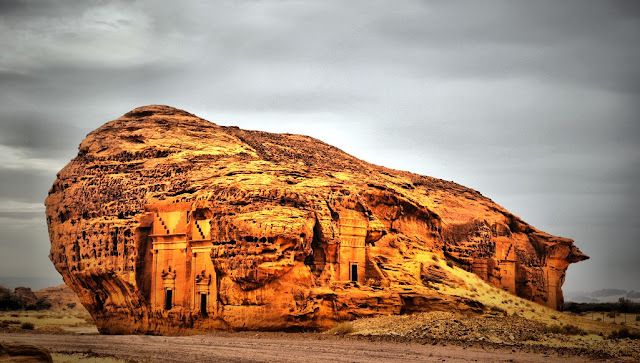 While, the former is the Palace of the Daughter, which, with its 16m height is the largest tomb at Mada’in Saleh, the latter stands independently as a huge tomb construction carved into the cliff. Though the tomb was never finished, the following dedication is visible, carved into the stone: ‘To Hayyan, the Son of Kuza and his descendants’. 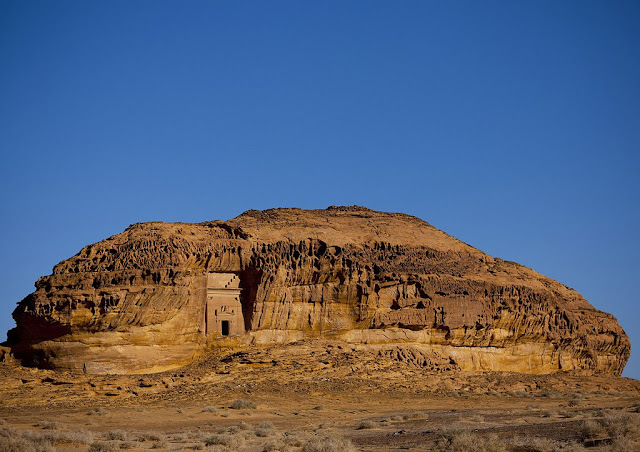 Moreover the Mada’in Saleh ruins are surrounded by hills yet lie on a deserted, volcanic plateau which, thanks to sustainable water sources and fertile soil, has always attracted settlers. 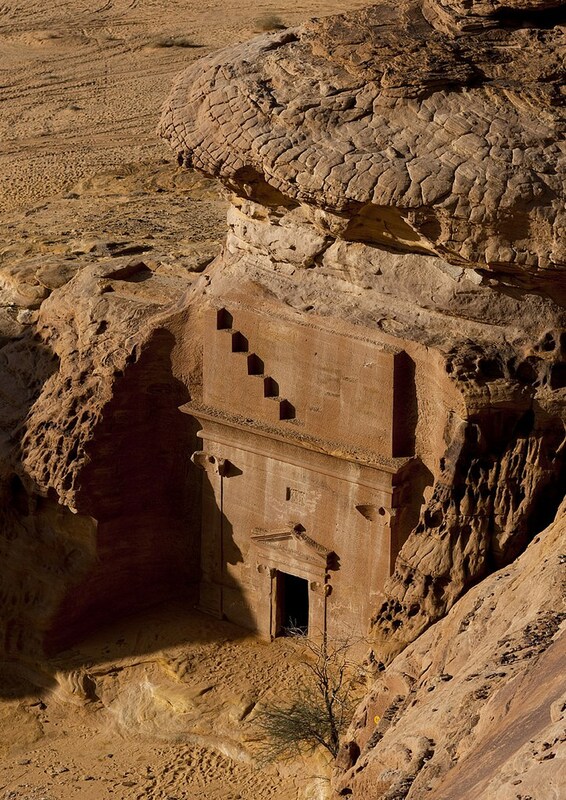 The enigmatic Nabataeans were originally a nomadic tribe, but their settlements began to flourish. As well as their agricultural activities, they developed political systems, arts, engineering, stonemasonry, and demonstrated astonishing hydraulic expertise, including the construction of wells, cisterns, and aqueducts. These innovations stored water for prolonged periods of drought, and enabled them to prosper. 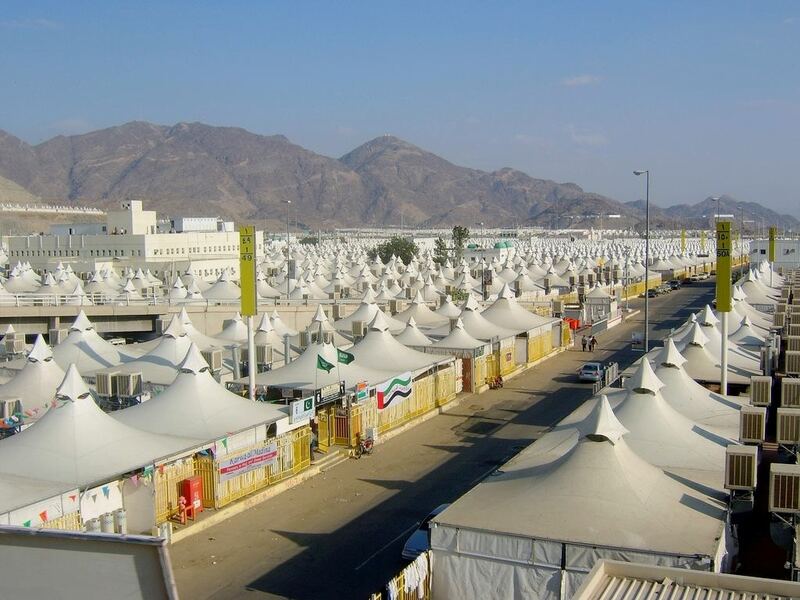 They expanded their trading routes, creating more than 2,000 sites in total in the areas that today are Jordan, Syria and Saudi Arabia. Archaeologists still try to unravel the history of the Nabataeans, which in large remains unknown. In Mada’in Saleh, you can see several large boulders rising out of the flat desert, and most of the structures seen were used as tombs, all of them cut into the surrounding sandstone rocks. 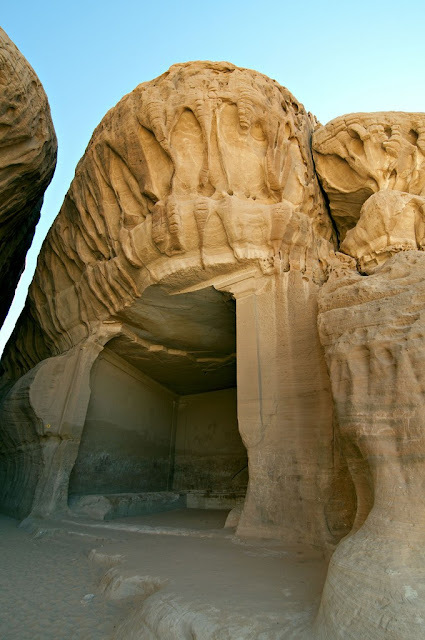 The area has multiple quarries that the Nabataean masons are said to have used to cut and carve stone blocks. However, no buildings utilizing stone blocks have ever been found so it is unidentified what exactly the quarries were used for. The mystery may lie below the sand of the desert, with monuments still waiting to be explored. 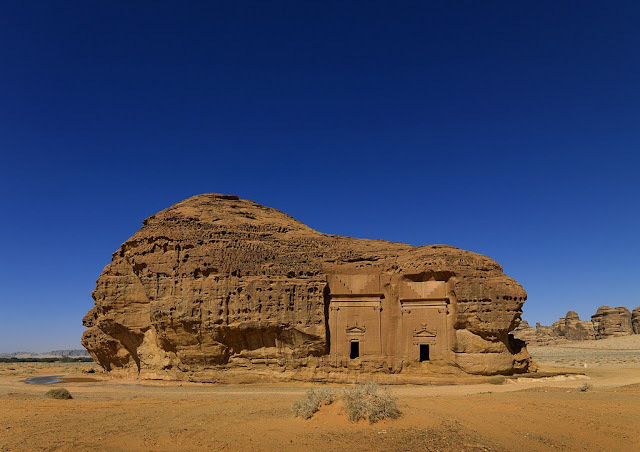 Therefore, the site has gotten a reputation as a cursed place an image which the national government is attempting to overcome as it seeks to develop Mada'in Saleh for its tourism potential. Medina has several important places in Islam, in which “Mount Uhud” is one of great site for Muslims. 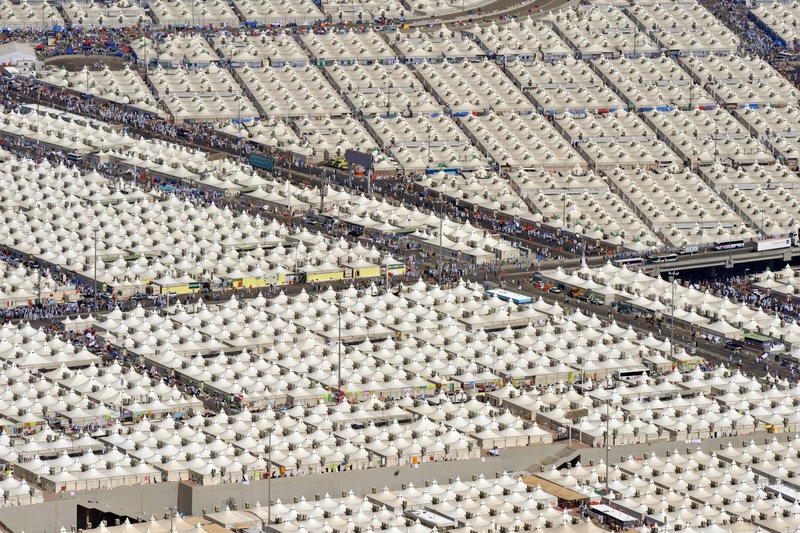 It is also known as “Battle of Uhud”. It is located 5km from Masjid-al-Nabawi an important place in the battle of early history of Islam. 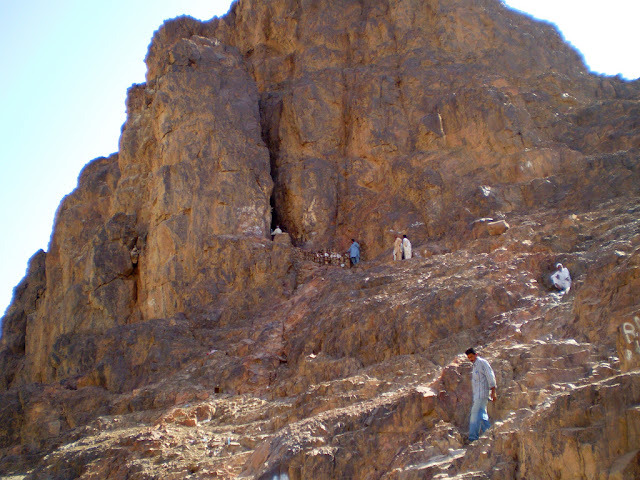 Mount Uhud comprises of group of mountains has rich history in Islam. Although there is still possible to climb the small hill and see the surrounding area as well as the graveyard of the martyrs. The Uhud Mountain is on short drive from Outskirts of Medina and very interesting story to share the knowledge. Well, related to the Battle of Uhud is “Cave of Uhud” which is quite far from the battle site. 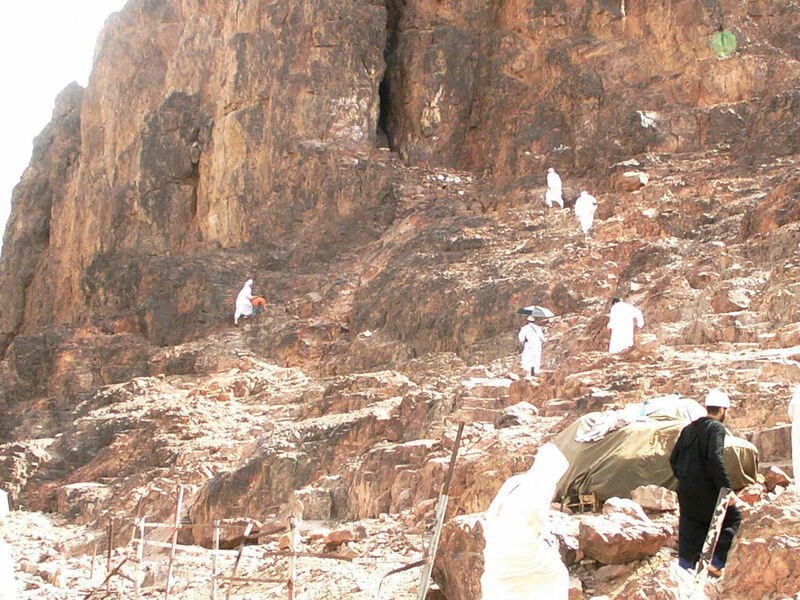 The cave located on the side of Mount Uhud is the place where Prophet Muhammad (PBUH) took refuge after being wounded in the battle to receive treatment. 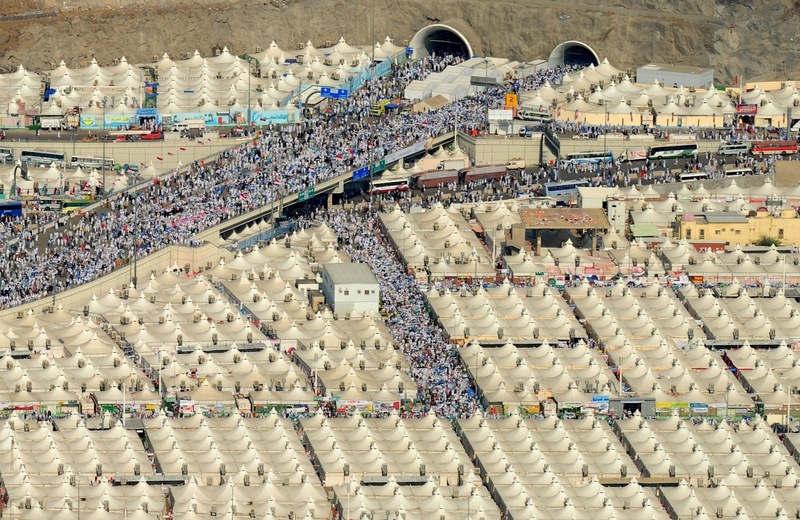 The site is not encourage by Saudi government, as you’ve to be physically very fit to climb up and tried to get in. 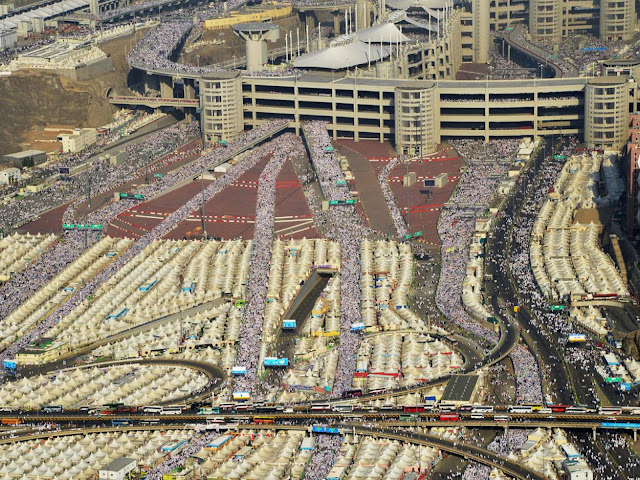 However, not many could do that, but those who’re fit tried to follow the path that the Prophet Muhammad (PBUH) climbed. 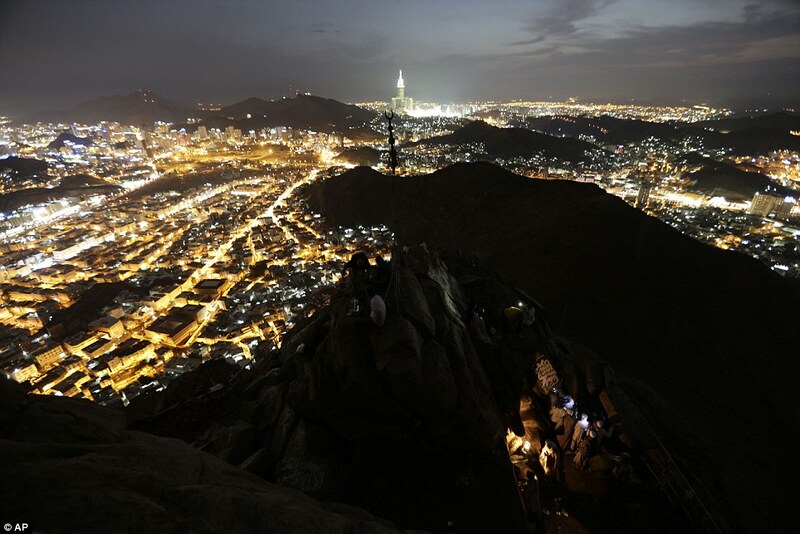 From Cave, you can have rare stunning view of another part of Madinah. 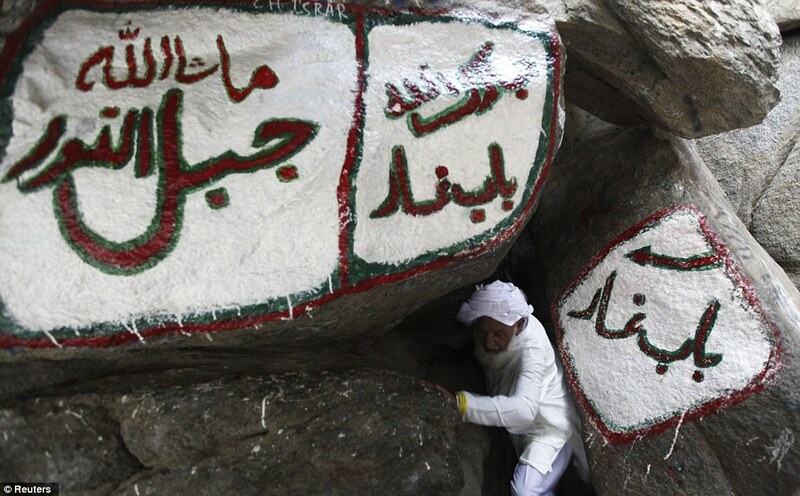 In the cave, a sweet smelling scent all round, and some say’s it is the smell of Prophet Muhammad (PBUH) still here. While sceptics would say, it could be perfumes the peoples use as a sign of respect for the place. Therefore, the fragrance, along with the awe of lying here bursts the heart, intoxicates the mind, releasing floods of blissful tears. 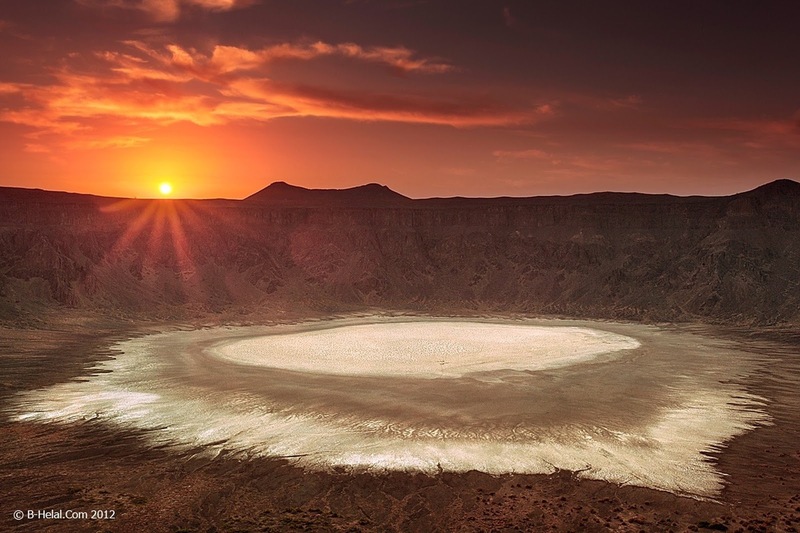 This massive crater is long thought to have been created by an ancient meteor strike or may have been found to volcanic activity after a massive underground steam explosion caused a mage flow ran into a subterranean source of water. In result of huge eruption a colossal amount of earth into the air leaving behind this crater. 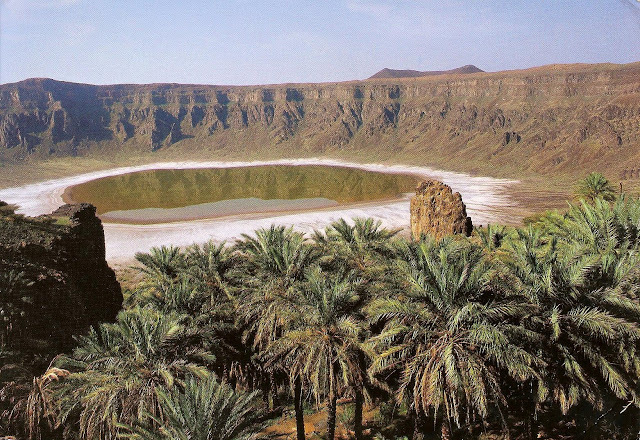 Al Wahbah Crater 1.2 miles across and more than 800 feet deep, located in the middle of flat, barren desert of Taif Saudi Arabia. 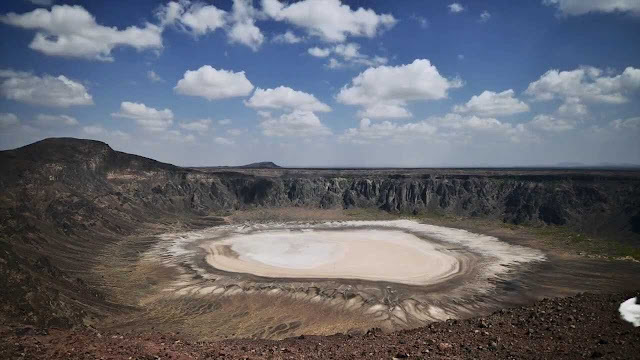 The crater is natural anomaly that would have been a wondrous enough on its own and hides its own salt field in its giant bowl. Al Wahbah Crater is an impressive pock mart on the earth holding stunning salt flat in its depth. Therefore, white phosphate plain forms a pattern of beige psychedelia that creates the spot all the more attractive. Moreover, the strange salt point is, the green vegetation grows on and around its rim, even though crater is arid and barren. The Al Wahbah crater is home to beautiful palm trees and shrubs. 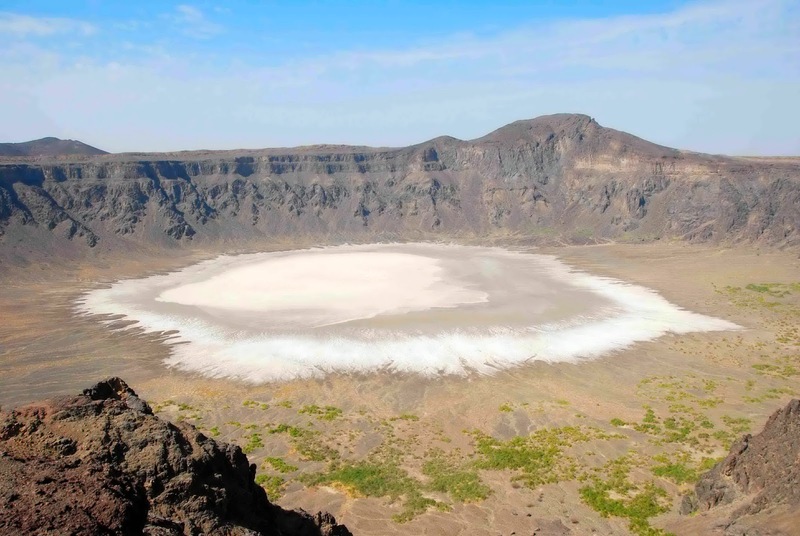 With the passage of time, the crater importance is converting into big tourism place and Saudi Arabia government has set their sights on the crater, providing facilities like building roads and market to the site to make it easier for tourist. The crater is also getting popular site for camping and walking. Moreover it’s not difficult to climb down from the rim to the bottom of the crater there from the North side on a prepared path, though maximum circumference has steep, unclimbable cliffs. However, at the top of the path is a stone hut which covers rubbish and debris, and some appropriate places for camping, although there are better places to camp to the South. Therefore, if a person wants to get in the middle of crater, then he might go in 15 to 25 minutes, but be remember this crater is very slippery and hard for people to come up to the surface. Thus, to climb back up takes 20 to 40 minutes max. Hence there is only one paved route down into the crater and not recommended to climb down in groups of less than 3, as the path is quite loose in several places and the risk of accident is high, whilst not huge, is ever present. Also there is no mobile signal within the crater, and the site receives very few visitors without a doubt, even over weekends. 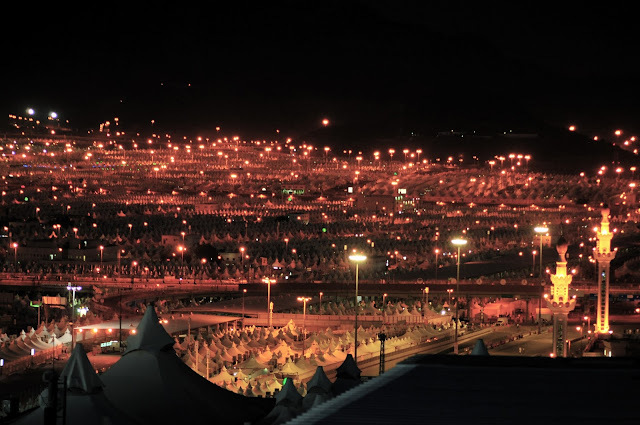 Jabal al-Noor is also called “Mountain of Light”, or “Hill of Illumination”, “Hill of Enlightenment” is a mountain near Makkah in Saudi Arabia Hejaz region. 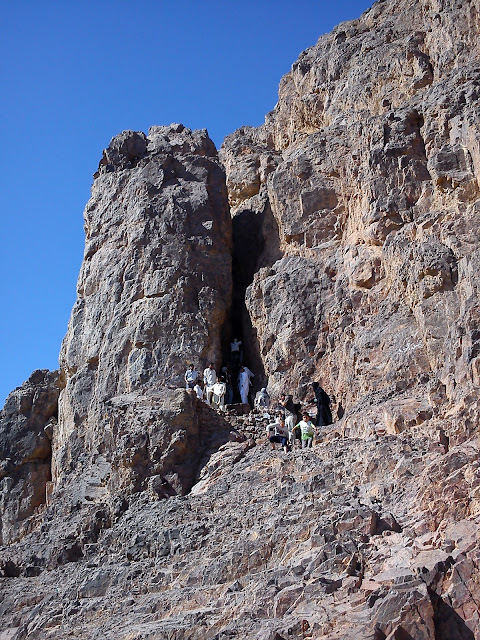 Jabel Al-Noor is popular place in Makkah due to famous Ghar-e-Hira situated on it. It is a small cave only four arm’s length long by 1.75 arm’s length wide and 640m tall. Almost five persons can sit in it. Well, a physical fit man can take two hours to make it to cave. 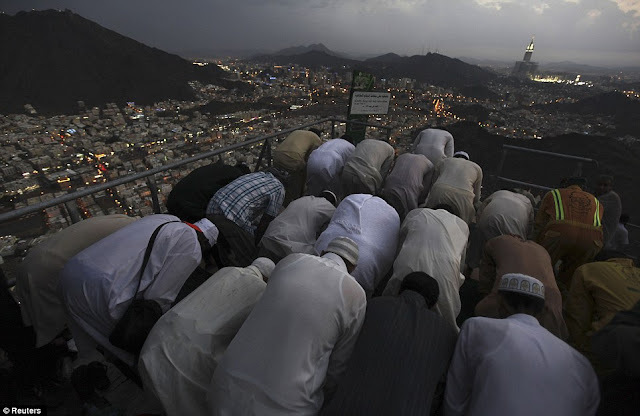 It is extremely strenuous on the individual; the mount and cave hold holiest significance for Muslims around the world. Well, one physical feature that differentiates Jabal al-Noor from other hills & mountains, that its strange-looking summit, which makes it look more like two mountains on top of each other The Cave (Ghar-e-Hira) is situated on mount Al-Noor on way to Mina near Makkah and its peak is visible from a great distance. 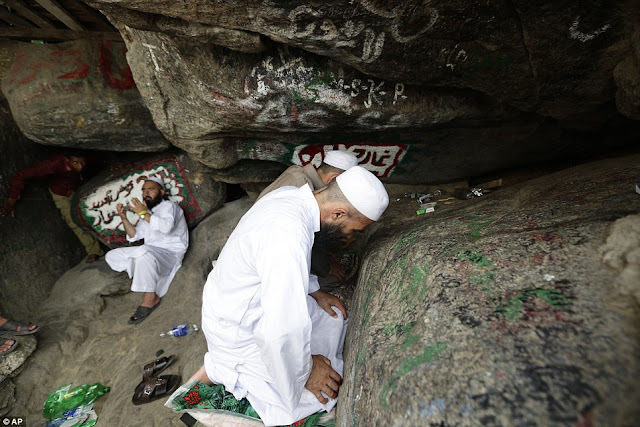 Even one can see Kaa’ba straight and clear from this cave. 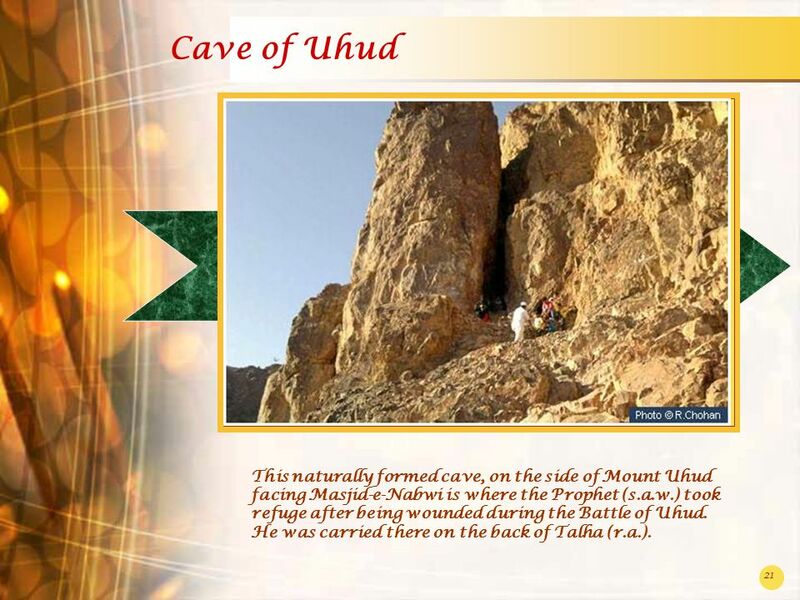 The legendry Prophet Hazrat Muhammad (صلى الله عليه و سلم) spent great deal of time in this cave. 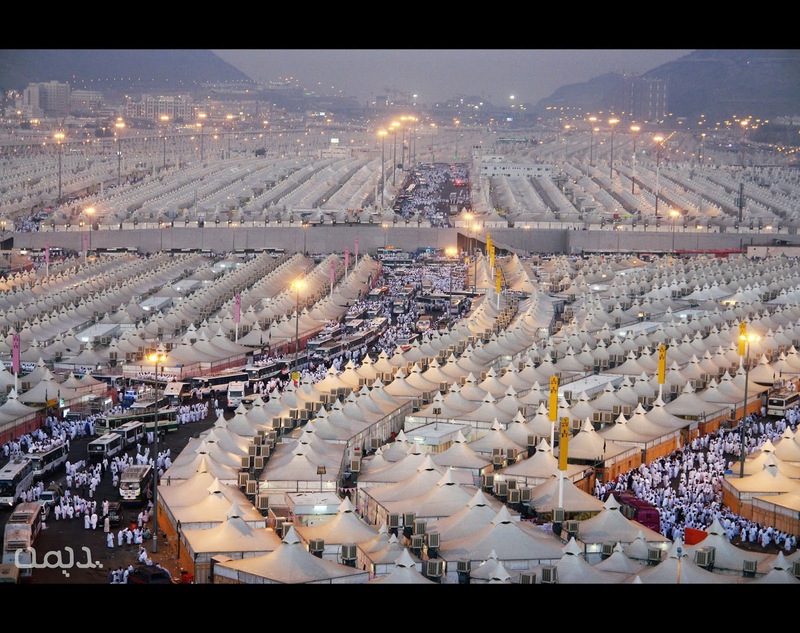 This is the place, a lot can write on this, if someone wants to write the imperativeness of Jabal Al-Nour. The top Jabal Al-Noor in the mountainous desert is one of the loneliest of places. 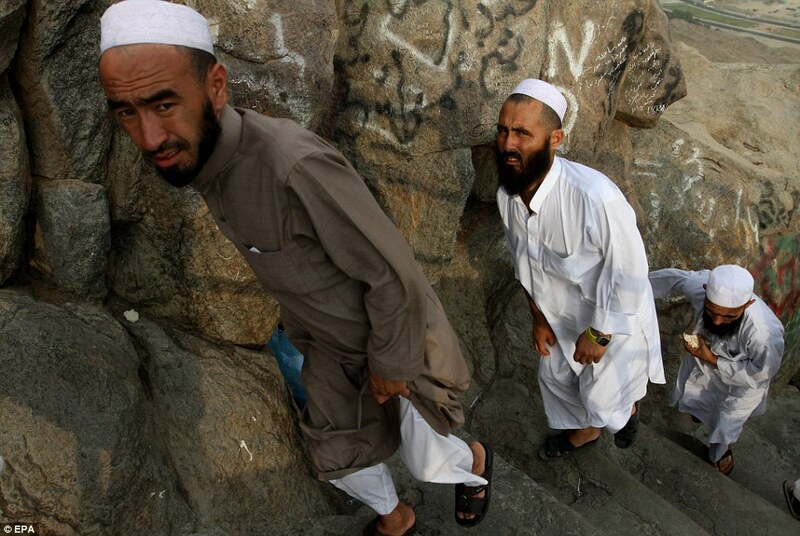 However, the cave within, which faces the direction of the Kaaba, is even more isolated. 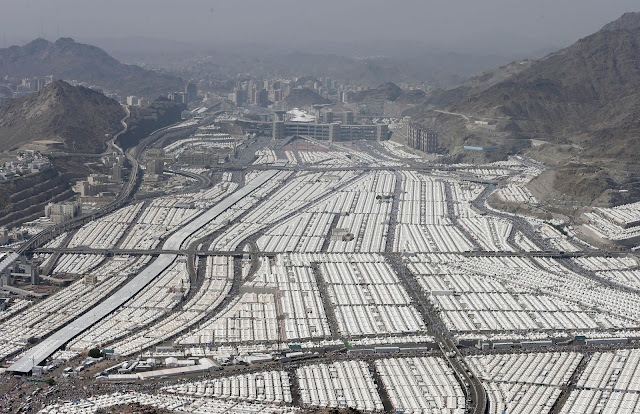 This is the site, choose by Allah for worshipping of his messenger in solitude to commence a new era of life on earth when ignorance eclipsed the human society for several centuries bid farewell to the light of knowledge and wisdom. Allah’s Messenger Prophet Hazrat Muhammad (صلى الله عليه و سلم) used to spend their time for many months praying to Allah in loneliness away from all interventions of this world. It was the day the earth and skies and all in them were waiting anxiously for a long time. 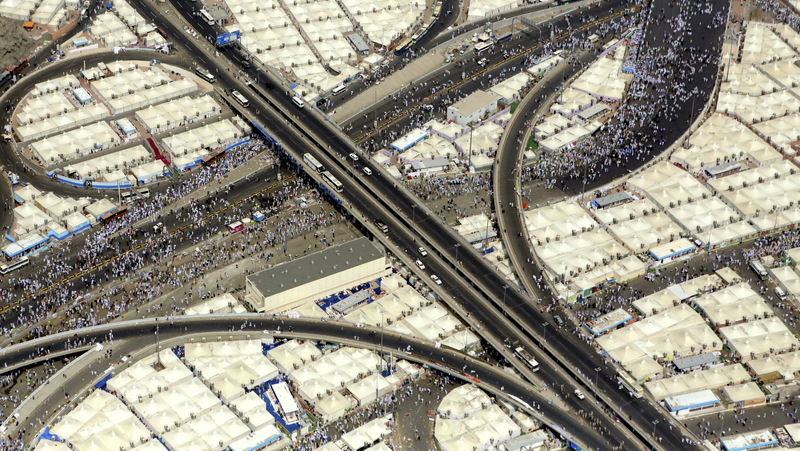 It was the day when Prophet Muhammed (صلى الله عليه و سلم) was assigned the duty of preaching Allah’s orders to the entire Mankind and Jinn. 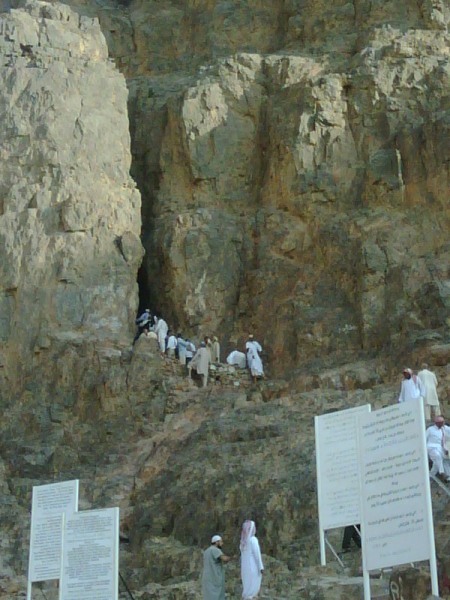 This “Cave of Hira”, the sanctum of the Holy Prophet Muhammad (PBUH) a place of his great devotions and meditations, a sacred cave where the Holy Qur’an began to be revealed. 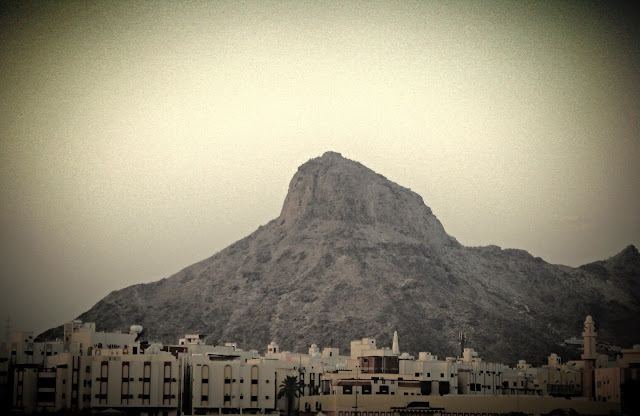 Allah’s last Prophet Muhammad (peace be upon him) had just stepped into the 40 years of his life, when during a night in the month of Ramadan the first 5 verses of the Surah Al-Alaq (96) were Revealed to him and mountain was given the title of “Jabal Al-Noor”. The precise date of the first revelation can be seen through investigation to fix the time to Monday the 21st of Ramadan at night, i.e. August, 10, 610 C.E. or exactly 40 lunar years, 6 months and 12 days of age i.e., 39 Gregorian years, 3 months and 22 days. Which is this place? No question, almost all Muslims know it. Jabal Al-Noor with steep slope 200m tall and all Muslims devotees visiting Jabal al Noor from various part of the world walk a few steps in the plane and feel exhausted. Every year countless people force their way up neglecting harsh desert climate conditions to see the place where their beloved Prophet Hazrat Muhammad (صلى الله عليه و سلم) got his first heavenly revelation by Hazrat Gabriel (A.S) “The Angel of Revelation”. 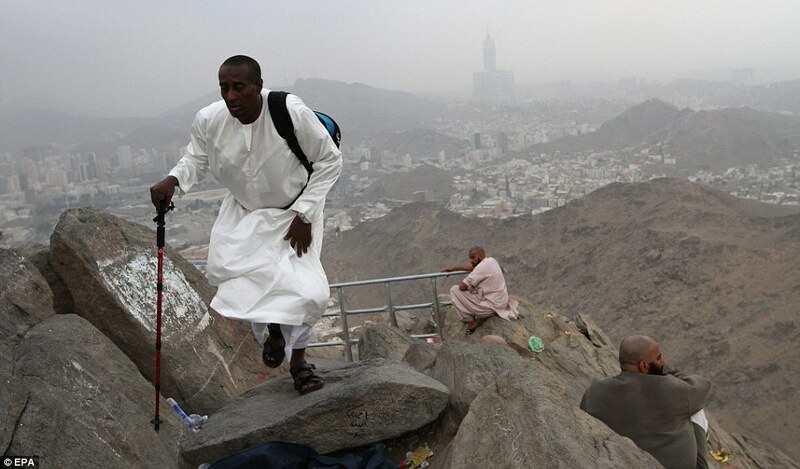 Therefore, one would wonder how Prophet Muhammad (صلى الله عليه و سلم) climbed this mountain countless times and stayed atop of the mountain for many days in succession with these unfavorable conditions. One would really feel and shed some tears on the sacrifice shown by Hazrat Khadeeja-tul-Kubra (رضي الله عنها) at the age of 55 who climbed up taking provisions to her husband Prophet Muhammad (صلى الله عليه و سلم) at least once in a day.